A New York scientist is attempting to edit the DNA of human embryos - a similar and controversial method to what Chinese scientists recently came under fire for doing just months ago. 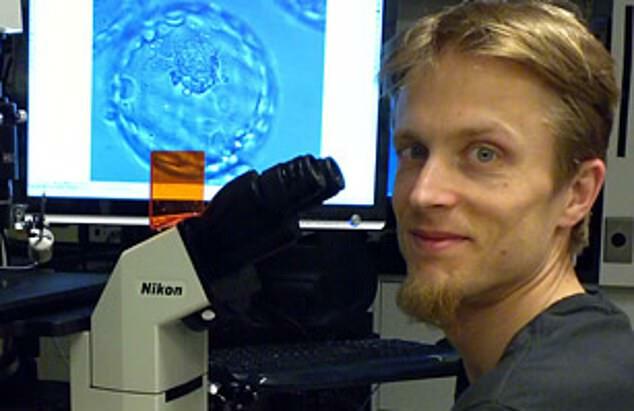 Dr Dietrich Egli, a Columbia University developmental cell biologist, is using the Nobel Prize-winning CRISPR gene-editing method to try to repair DNA mutations in early embryos, he told NPR. In November, a Chinese scientist went public with the news that he had already edited the genomes of twin embryos - and that they had developed and already been born a pair of healthy baby girls. Dr Egli himself called that work 'genome vandalism,' but claims that his own experiments are purely for research purposes and intended to determine the safety of the procedure. Currently, he told NPR, he is destroying the embryos after just one day of development, but in order to fully understand the safety of the procedure, Dr Egli will have to allow the embryos to develop for longer, raising serious ethical questions. When it was developed, the CRISPR technique - which works like a chemical cut and paste, finding and removing faulty genes before replacing them with better copies - was hailed as hope for the end of genetic diseases. In theory, this could mean preventing any babies from being born with genetic abnormalities, and no or low risks for disease with genetic components, a prospect that's appealing to parents on a personal level and could reduce the burden of disease on public health. But that could be a slippery slope. If scientists can edit out genes for problems, why couldn't they edit in genes for traits parents prefer? Drawing a line between disease prevention and 'designer babies' is fodder for nearly endless bioethical debate. When Dr He Jiankui, a scientist at the Southern University of Science and Technology (which insists it had nothing to do with the experiment) in China used CRISPR to edit the genomes of the twin embryos, it was to to prevent them from inheriting their father's HIV. But critics - of which there were many, and they were furious - argued the girls could have been protected from infection by other tried, true and empirically tested methods. Skepticism and, perhaps more importantly, deep uncertainty surround the Chinese twins (Lulu and Nana) because the procedure was done in secrecy and Dr Jiankui has not published a paper about the research. Dr Egli claims to be taking a more cautious approach. He is using CRISPR to repair genes linked to form of inherited blindness. But he says that his work is not intended to create gene-edited babies, but rather for 'research purposes' to test the safety of his method. 'We can't just do the editing and then hope everything goes right and implant that into a womb. That's not responsible,' Dr Egli told NPR. One by one, Dr Egli is 'dipping' sperm from men with the congenital of blindness (called retinitis pigmentosa) into a solution containing the CRISPR tool programmed to snip away the faulty genes. He then injects the sperm into the egg, which has healthy copies of the eye disease gene. The idea is that when they combine, the egg's healthy copy of the gene will sub-in. After the deceptively simple repair process is done, Dr Egli said that he just lets the embryo mature for one day of observation to see if the technique appears safe up to that point. But, of course, if the ultimate goal is to gene-edit the disease out of human's DNA, then eventually those embryos will have to develop fully. Law and regulation in the US (and abroad) are still grappling with abortion and the definition of conception. They have a long way to go to catch up with fundamentally altering babies. Until it does, work like Dr Egli's will remain an area of nearly un-paralleled excitement in the medical field, and certainly one of the most divisive.